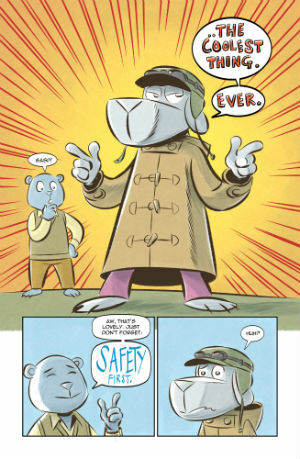 Jaime Huxtable’s versatile cartooning skills are always a pleasure to behold, and an equal pleasure to talk about. 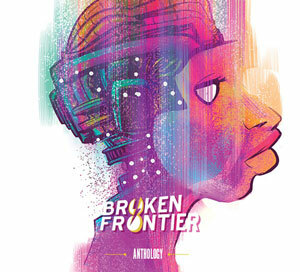 So it came as something of a surprise to me to realise that it’s been a few years since I last covered his solo work here at Broken Frontier; way back when I reviewed his multi-feature showcase anthology Jammo in 2014. 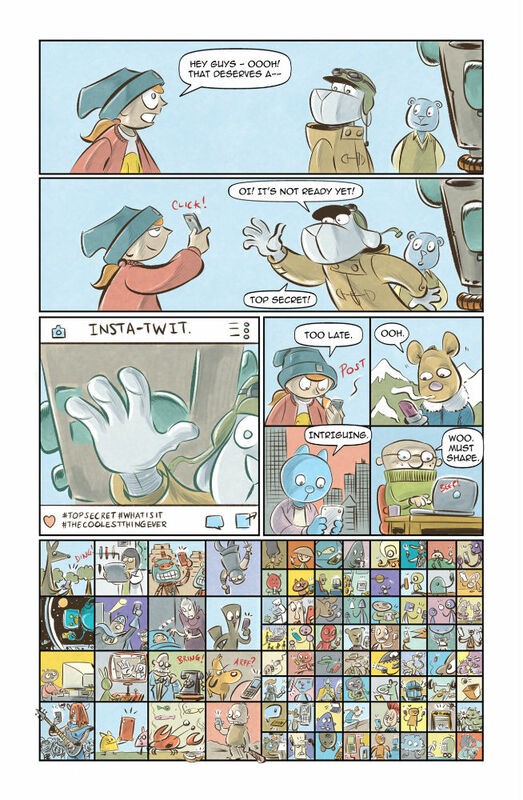 He’s popped up, of course, in the occasional group effort since then – perhaps most notably in the 2017 Broken Frontier Best Webcomic Award-winning comics activism of Draw the Line – but he’s been long overdue another BF spotlight. This is a special day though. Because today Jammo is going to invent “The Coolest Thing Ever”. Unfortunately, though, what the pair hadn’t banked on was their pal Ellie spreading the news of this development around the village while on her paper round. Soon even the mass interest in the local community is eclipsed by the attentions of the leader of the Evil Mog Army, Melvyn Smedley III, and his Mog-Mech Battle Robot. Will Jammo’s new invention live up to the hype? Can the trio see off the evil Smedley? And just what is ‘The Coolest Thing Ever’ anyway? 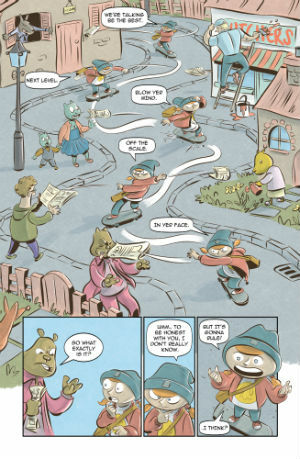 Huxtable’s jaunty tale employs a gentle humour that is comforting and accessible. It’s a perfect read for the target audience it’s aimed at with its combination of witty set piece interactions between the cast, and those bigger, action-packed scenes full of the kind of larger-scale slapstick thrills and spills that will immediately capture a younger readership’s attention. 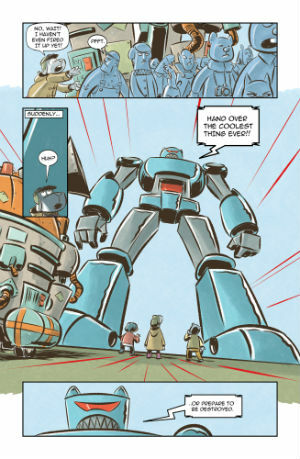 It’s indicative of his proven ability to play with pacing and timing to dramatic and/or comedic effect; to jump between the smaller character moments and the imaginative slam-bam excesses of the scrapes his protagonists get themselves into. It’s hard not to be enchanted by Huxtable’s ever engaging page layouts that often give a pronounced sense of motion and the passage of time. 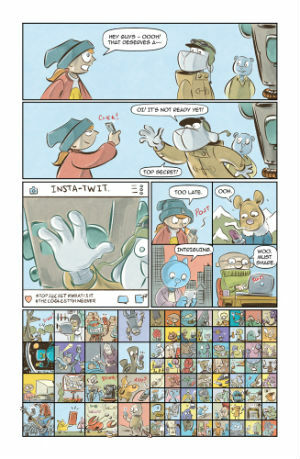 Check out Ellie weaving in and out of the one panel on her skateboard for example (above right), or how Huxtable captures the real-time virality of social media in dozens of ever diminishing panels within the same image (below left). He’s adept, as well, at using skilful lettering tricks to emphasise tone or mood. 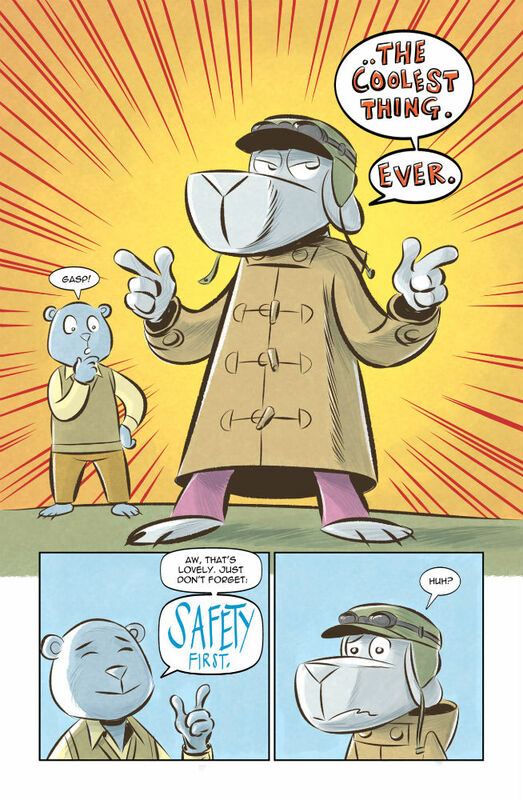 Animated and lively, and full of clever contemporary observational humour and likeable protagonists with a nice line in the traditional comedic straight man/clown set-up, this is perfect fare for younger readers of material like The Phoenix or – dare I say it – as an entry point into comics for fledgling fans. 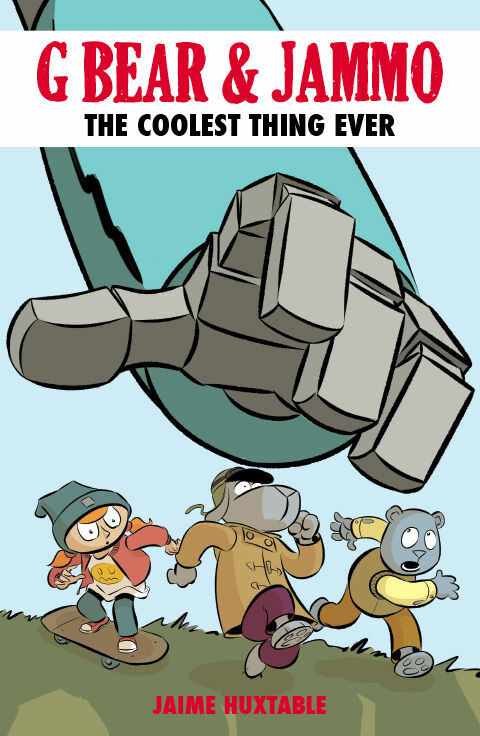 As to what “The Coolest Thing Ever” is… well it’s probably not what you’re expecting but it’s a very neat piece of narrative playfulness and it certainly lives up to the hype in its own endearingly eccentric way. The whole comic is available to read for free online but nothing quite beats print and there are some extras included you won’t see online. One to treat a younger reader with and then sneak a look at yourself to appreciate the sheer comics craft that is abundant in its pages. For more on Jaime Huxtable check out his site here. G Bear and Jammo: The Coolest Thing Ever is available from his online store here priced £5.00 or free to read online here. The BF Bulletin Board – The UK Small Press at TCAF and ComicPopUp in Brighton this Saturday May 13th!